In early 1971, radical students chose Amar Shonar Bangla as Free Bengal’s national anthem, and when the war ended, the new republic’s leaders endorsed it. Why did they choose the song? For that matter, why did they choose the red and green flag? From all accounts, the song was chosen because of its evocation of the rural landscape — mango groves and paddy fields, perennial features of Mother Bengal. And that’s what the green in the flag meant to the more radical students, though for others green symbolised Islam. But it was stressed that everyone was very conscious about choosing inclusive icons. This contrasts sharply with Bangladesh’s neighbours. The Pakistan Movement adopted the crescent, unsurprisingly alienating all non-Muslims in the lands that became Pakistan. Indian nationalism claimed to be inclusive, espousing secularism as a fundamental value. But Gandhi’s Ram Rajya did not appeal to Muslims, nor did the spinning wheel, which everyone thought symbolised eternal — that is, pre-Islamic — India (quite ironic, really, as according to Irfan Habib, the earliest known reference to the spinning wheel in South Asia is a 1350 polemic urging Raziya Sultana to give up Delhi’s masnad and take up spinning, the ‘inescapable inference’ being the device having a Muslim provenance). So, Bangladesh made a conscious effort of being inclusive at its foundation. Something to celebrate on its 40th birthday, surely? The opening play “Macbeth” (in Malayalam) by Santhosh, stood out for its visual treatment. The motif of guilt-ridden and doomed souls trying to wash off the blood stains on their hands pervaded throughout. Through surreal video clippings, use of reflections and body movements, it explored the possibilities of the visual narrative. As the director puts it, the play tried to observe the inter-play of fundamental human nature of concerns, desires and greed that don the stage of conscious and sub conscious mind. 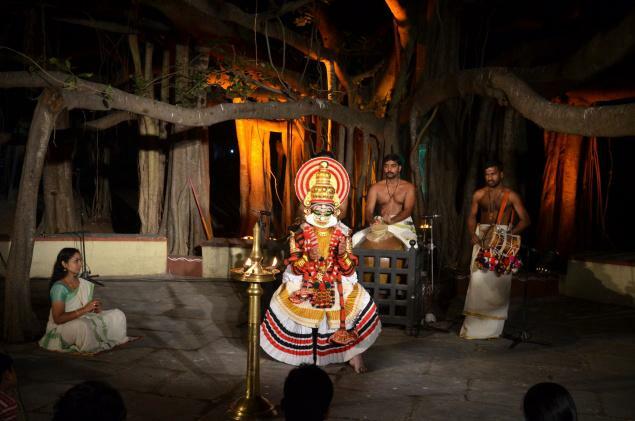 “Koodiyattam” by Margi Madhu in all aspects was a cultural translation. The briefing at the beginning and the introduction to basic gestures helped even the first-timers to understand the performance. “Nrupa padha adhirodhim dhushkaram naasthi kinchit/ adhiga bharanambho kashtamevam nrupanam/ (Becoming the king was not at all difficult/ to protect the throne and the kingdom thus gained is the most difficult task) – As the actor enacts these Sanskrit lines, the plight of “Macbeth” slowly unveils before the audience. The plot was transplanted into a Kerala scenario, or rather the inherent cultural elements in the art form stood out. Macbeth’s victory was celebrated with pomp, complete with an array of traditional instruments like chenda, maddhalam, edekka and thimila; and King Duncan was served a traditional Kerala feast by his host Macbeth. The parts where Macbeth enjoys the percussion with the rhythmic movement of his body, the expressions of the host assuring the king to enjoy the feast and Macbeth’s reaction when he has the vision of a dagger, were commendable. “Whether we could perform stories other than traditional texts in Koodiyattam is an often asked question. When we tried bringing new texts like ‘Macbeth’, they were well received and that gave us the confidence that we could present any story through this art form. The classical nature and the structural strength evolved through the years have given it the flexibility to accommodate creative experiments,” said Madhu who conceptualised and performed “Macbeth”. But, in doing so he strictly adheres to the traditional tenets of the art form. Read this man fallen amid letters. the blood spilled on the soil? So the bell rings this afternoon. desperate clanging. i open the door and there is a man with forms in his hand and a general irritated demeanor. figured that this was the census man. he comes in and settles down. starts by wanting to know who the head of the household is. i say there is no one. he insists. i continue to say no one. He proceeds to explain that if the parents live in the house, then they are the head of the household, if married then the husband is. I proceed to ask for definition and say that all three of us who live in the house are head of the household since we all earn and take decisions. he promises to erase what he has written since he was sure my mother was head of household. He seemed to find my gender a bit dubious so questioned my mother if i was a boy or a girl and then repeatedly said “ladki” to me. having established that i indeed was a woman, he wanted to know date of birth, which was not difficult, but place of birth he found extremely challenging. he could not get his spellings right, or did not know districts or states in the country so tattamangalam in palghat district in kerala was as baffling as mysore in karnataka. calcutta was easy to deal with and he said calcutta was in calcutta!!! mother tongue caused him more angst because he had to write malayalam and again the spelling eluded him. In a casual manner he asked – sabke haath pair to theek hain? ( is everybody’s hands and legs okay?). i realised that this was the question on disability. i said yes that’s all fine but i cannot see without my glasses. that did not count. Education, marital status were easy-peasy and then the tricky question of employment. he just could not understand what i did and what did i mean when i said i was a consultant and what were NGOs and did i work with these afore mentioned NGOs in haryana. and could i not give him just one name so that he could put it down. Sujata’s employment was even more difficult for him. counselor on chemical and substance abuse – in hindi its deadly, sharab aur nasheeli padarthon kay sevan karne walon ko in cheezon se mukt karane ki kaam karti hai! asked caste and we said that we did not know since we were urbanised and had to confess that it sounded foolish even to my ears. The enumerator is a teacher in a school in haryana somewhere but as far as we were concerned, we were aliens who occupied some strange space. a place where he hoped he or his family would not have to tread. a household where three women rule, where a woman aged 46 says that she is unmarried and is not ashamed, does not for work everyday and i suspect he had not heard of the words human rights – in any language! what do you think he teaches , if he is not sure of the states in the country! mysore was difficult, can you imagine if it was daporijo or mokukchung? What is the point of being counted thus. he is baffled by the names of villages, states, languages, does not realise that disability is of many forms, that men can look like women and women can look like men…. his world is being torn asunder in this process…were they trained at all and what do you think will actually emerge from this huge effort to have an idea of who lives in this country?